Bingo is one of the most favorite games in most parts of world & that is why I am here with an amazing app for playing 75# US Blackout pattern bingo game – Blackout Bingo Tracker. Note that this Bingo tracker App is used for Non-electronic traditional land based bingo halls. As Is aid this card tracker is used for US pattern of Bingo games and it is majorly concerned about the last game that you play as jackpot that can win you from $500 -$2000 according to your gaming challenge. This app does not directly guarantee you any winning pattern, but it lets you purchase and track as many cards as you can type into the system before the blackout bingo jackpot game begins. 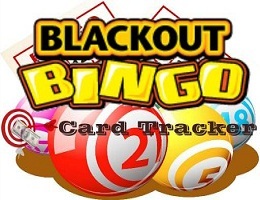 So your chances will be definitely higher to win the bingo jackpot if you test with Blackout Bingo Card Tracker. If you are still confused about How Blackout Bingo Card Tracker Works, Check out this amazing demo video which explains everything in detail. The most important reason you would like to have this app is because it can be used on web interface as well as Android smartphone. So you can take a laptop with you purchase some cards and try the game before you go for jackpot. The main feature being if you go into a bingo hall without electronic bingo buy 100 to 200 cards for a jackpot game, type them all into this app and then can tell if you can bingo on those paper cards I bought! – Manual Bingo Card Entries. Note: Blackout Bingo Tracker always require Internet access & Subscription. AudioNotepad HD iPad App Review: Most Unique Notes App for iPad! Options For Smart TV Users - Web, Apps & High End Gaming!